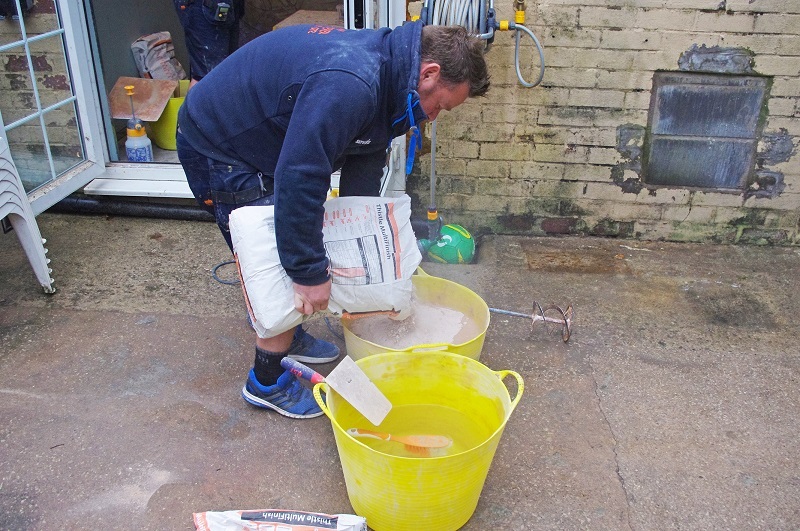 As British Gypsum celebrates 100 years in the industry it wants to champion the trade and has been out on the road meeting some of the unsung plastering heroes. 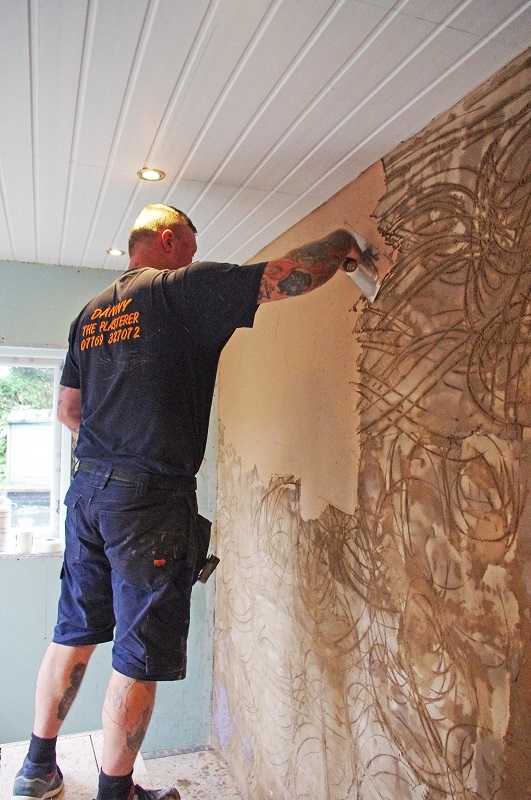 In this third feature, British Gypsum catches up with Blackpool plasterer Danny Sharratt. Being on call 24/7 and aiming for a response time of less than eight minutes can be challenging – especially when it’s not your day job – but when people are relying on you you’ve got to give your best every time. As well as a plasterer, I’m a volunteer Crew Member for the RNLI in Blackpool. It’s an amazing honour to serve the charity and literally save lives, I’ve learnt a lot through volunteering and much of it has transferred into my work as a plasterer – the trust, punctuality and dedication. My career in plastering started more or less by accident. I had a friend working at a building company when I was leaving school and he got me an interview with his boss, who offered me a job on the spot. I served my time at the company as a brickie and my friend as a plasterer. After a time we set up together and over the 20 years with him, I learnt his trade and he learnt mine. Our main game back then was building swimming pools but then my friend decided to take an opportunity to emigrate to Australia and I kept the business going until 2013. It was then that I became a sole trader and Danny the Plasterer was born. My tagline is ‘Quality work at affordable prices’ and throughout my career that is what I’ve aimed to deliver. When you’re working in someone’s home you’ve got to get it done right and, while you have to make a living, you shouldn’t be ripping people off in the process. On the other hand, it is unfortunate that so much of our work is dictated by price, as quality can and does suffer – too many times have I been to jobs to put things right because the cheapest quote got the job and was done poorly. I’ve found that sensible pricing is the best way and the proof would be the fact that I’m regularly booked up for four months in advance. The job I’m currently on is the conversion of a coalbunker / outhouse into a man cave. We’ve moved some internal walls and doors, plus rewired and waterproofed with sand and cement. We’ve also studded and used moisture board for added protection and now we’re plastering. We’re using Thistle MultiFinish, which is really easy to apply on a wide variety of surfaces but ideally on this job we would have used Thistle UniFinish because it cuts down some of the prep work. Check out the first two parts of the series here and here. For more articles about British Gypsum click here, here and here. So what makes a good plasterer? 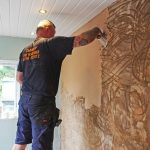 Beyond the actual skill of plastering I would have to say the most important thing is communication and manners – you’re not going to get a foot in the door without being polite and approachable. Also, you’re not going to get much repeat business or referrals if you don’t treat your customer’s homes with respect. 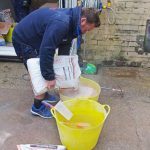 I’ve found being clean and tidy goes a long way, especially as a plasterer, which is seen by many homeowners I meet as one of the messiest trades. As a result, I do very little advertising and most of my work comes through word of mouth. My volunteer work with the RNLI has taught me the value of clear and honest communication. When you’re at sea and helping someone in distress, there’s no room for misunderstandings and this is something I mirror in my day job – say what you’re going to do and keep the customer informed while you do it. Over the past 30 years I’ve probably had about 15 different apprentices, some of them good, some of them not so good. In general, I feel the best training is that which gets apprentices site ready. Maybe I’m too old school (I still nail beads on) but I think apprentices should be trained to use a wide variety of plasters on all different backgrounds. The plastering trade can offer a fantastic career of steady work, so my advice to apprentices or anyone entering the job is to put the work in, ask lots of questions and pay attention and you’ll be on your way to making a good living for the rest of your life. Indeed, I don’t see the trade disappearing at all with all the new housing pushes, the greater need for social housing and the fact that so many people now are adapting older homes for modern living. Personally I’ve seen the relaxation around planning regulations has encouraged a lot of people to invest more in their property with extensions and conversions. Further to this, popularity of all the home renovation programmes is giving people the bug for change and generating a lot of work in the home improvement sector. Looking to the future, one thing I do think will become more commonplace in the trade is spray plaster. It’s been on my mind for a while to potentially invest in a machine and I still need some convincing but I can definitely see things going that way – the time saving element is simply too big to ignore, especially in the external render market. 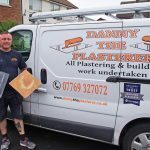 Danny Sharratt is a great example of a plasterer doing an honest day’s work for an honest day’s pay, offering true value to his customers. His character is one that should be praised and emulated throughout the industry of delivering quality work and real care. Look out for British Gypsum’s next interview in the next issue.